This is possibly the most incredible breakfast I have ever had. I know that sounds like a lofty assumption but you have to try this, today or tonight. It really is hard to describe how incredibly delicious, warming and perfect this breakfast is! 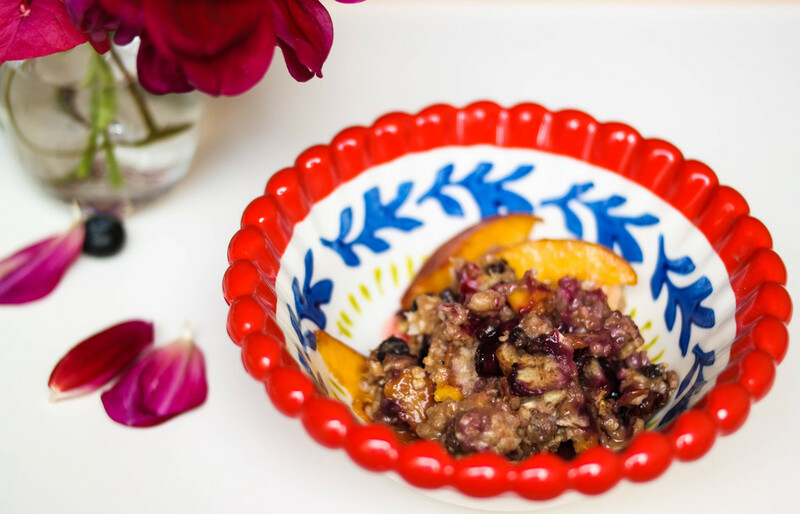 It is so easy to make as you just bake the fruit with the oats. But that is where the harmony of this dish takes place. As you bake the fruit, the flavors come together, blending layer upon layer of sweet fruit bursting upon more sweet fruit! It is a dream breakfast for fruit lovers. I am so enamored with this dish and as with everyone I have made it for. It is the kind of dish that is so filling and versatile you can have it for breakfast, lunch, dinner, dessert or as a snack. I have done all five and each sitting still leaves me wanting it for my next meal! The flavor of the soft peaches, gliding with the sweet juice from the blueberries, nestled in the corners with the tart raspberries, is the perfect bite. Delicious doesn’t even give weight to how wonderful this baked oatmeal is. Not only does it have the most incredible sweet cinnamon aroma when nearly finished but also each ingredient is so good for you! This is a simple recipe that is especially great to try if you are just starting to eat a healthy diet. It gives just a glimpse into how delicious, easy and healthy eating this way can be. The bananas in the oatmeal are one of the best sources of natural potassium, which helps in preventing muscle cramps after working out. Blueberries are perfect in a morning dish as they have a low glycemic index, which keeps your blood sugar balanced, as to prevent spikes leading to lower energy. The oats also contribute to preventing low energy levels as they are filled with fiber, which keeps you fuller for longer. One of the best energy givers is the maca powder. I love adding maca powder to any breakfast as it gives such a lovely caramel flavor and is full of vitamins, energy providing compounds, and helps alleviate muscle cramps. If peaches aren't in season, feel free to use any fruit available - apples or pears would be great as well! Enjoy! Start by preheating your oven to 350F and boil 1½ cups of water. In a separate bowl add the oats and chia seeds and pour the hot water on top. Let this sit until the oats have absorbed all the water. Be sure not to add more chia seeds as they will expand and turn the oatmeal too gooey and it will be hard to mix. In the meantime chop 1½ bananas, 1 peach, and pecans into bite size pieces and add to a large mixing bowl. Add the remaining fruit, raisins, currants, cinnamon, maca powder, and honey to this bowl. Now also add the oats and almond milk to this bowl and mix very well so that all the fruit is coated in the delicious cinnamon almond milk. Simply pour the batch evenly into a baking dish and top with thin slices of the remaining peach and banana, bake for 20 minutes. Feel free to reheat this the next morning until warmed. I have done this many times and it still tastes delicious! Enjoy this at anytime of the day!